Check out our changelog and download the latest release to benefit from the new features and bug fixes. Access Control List (ACL) is the way in which Windows manages permissions on NTFS file systems. There are several command line tools on Windows for handling this: cacls, xcals, icacls. Unfortunately, these tools are not always present in a default Windows installation and depending on the Windows version, different tools may be required. BitRock InstallBuilder now provides you with <setWindowsACL> built-in actions. 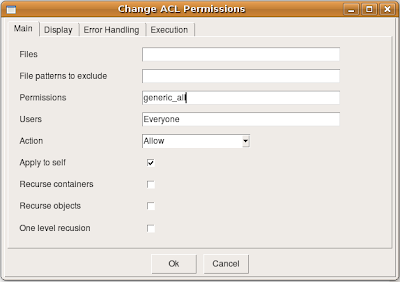 This powerful action for managing permissions allows you to modify ACL on Windows. It is based in the icacls windows tool (http://technet.microsoft.com/en-us/library/cc753525(WS.10).aspx). You can define the files you want to apply the permissions to. It allows you to specify if you want to "allow" or "deny" access. You can also match a list of users for which the permissions will be applied, and to specify any of the allowed permissions types. Note that ACL are only supported on NFTS file systems. The following example will allow all users in the system to read, write and execute the files that match the pattern in <files>. For the directories that match that pattern, the users will be allowed to read the content and write new content in that directory. <self> : determines if the objects specified in the <files> tag will be modified or just their children, if the recursion tags are enabled. <recurseOneLevelOnly> : Only applies inheritance to the first level of hierarchy if one of the below are enabled. <recurseObjects> : Applies inheritance to objects (files). <recurseContainers> : Applies inheritance to containers (folders). 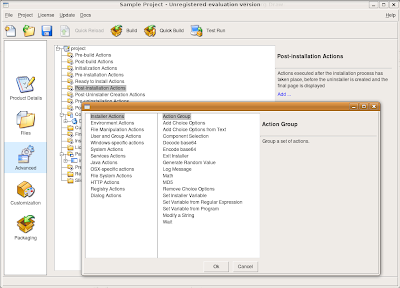 Of course this action is also available from the InstallBuilder GUI. The above describes the basic command line build process. You can also make changes to the project prior to the build process to adapt it to your needs using the --setvars flag. builder build project.xml --setvars version=1.2.3  project.fullName="New Installer Name"
However, there is much more you can achieve using this functionality.